Antistat ensure all our waffle / IC trays are antistatic and are available for use as either IC shipping and/or IC baking trays. Heat resistance requirements should be specified at the point of order. All our shipping trays are built in compliance with JEDEC thick and thin standard dimensions. Mid temperature trays can be baked to 140°C while low temperature trays can withstand a maximum sustained temperature of 65°C. Trays are constructed in modified polysulfone (PS) or equivalent for mid-temperature applications and polycarbonate (PC) for low temperature applications because of their high deflection temperature, superior strength, and dimensional stability. 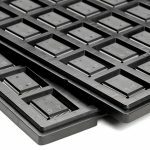 All JEDEC waffle trays have the same “X” and “Y” dimensions and are easily stacked for storage and manufacturing. Antistat are able to provide certain waffle trays from stock, however if you require trays for packaging more complex semiconductor devices then please contact us as we may be able to offer an alternative solution. Our team are on-hand to talk to you about our range of Jedec trays. Contact us via email or live chat today.